What is spinning and why should you care? In addition to torching major calories, spinning will shape your legs and glutes, strengthen your core muscles, and give you explosive energy. Also known as indoor cycling, this fun yet challenging activity simulates real cycling terrain, conditions and techniques using nearly every muscle in your body. Not to mention that you can burn as many as 750 calories in just 45 minutes! You’ll work up a sweat while engaging every muscle in your body. What Is Spinning and How Does It Work? A spinning workout is a great way to burn fat and stay in shape. It also helps relieve stress and keeps your heart healthy. 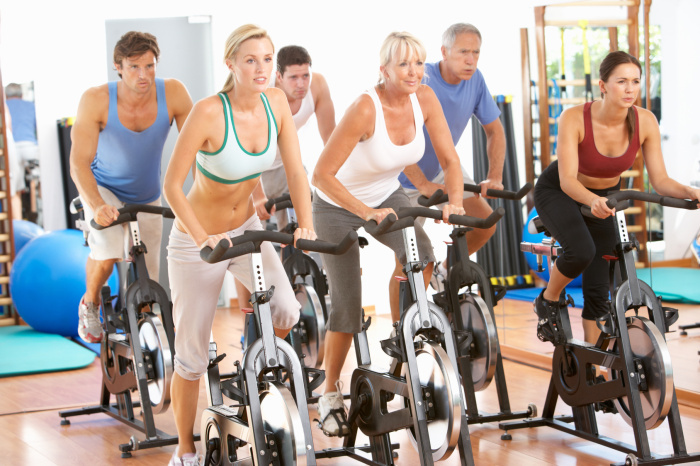 Spinning classes will get your endorphins flowing and improve your mood. With so many benefits, it’s no wonder why this activity has become popular worldwide. From kids and teenagers to pregnant women and seniors, indoor cycling appeals to people of all ages. Even those who haven’t exercised for a long time can take spinning classes and improve their overall fitness. This form of exercise is also called studio cycling. Most gyms and wellness clubs are offering spinning classes consisting of five to 20 people. A qualified instructor will tell you what to do, how fast to go, and how to get the most out of your workout. Participants can enjoy fun rides, including hill climbs, sprints, interval training, and fat burning programmes. Any gym that offers spinning classes is equipped with special stationary bikes. A typical spinning workout can last anywhere from 40 minutes to one hour. There’s nothing like finishing a class feeling exhausted yet ready for new challenges. The stationary bikes used for this sport are different than those designed for home use. In general, spinning bicycles have adjustable seats and handlebars, weighted flywheels that pick up speed as you pedal, and interactive workouts to get your heart pumping. Most workouts burn approximately 500 to 600 calories per hour depending on the speed and level of resistance. Compared to other forms of exercise, spinning has little or no impact on your joints. It’s safe even for those with knee and back pain. You can work out hard on a spinning bike without hurting yourself or feeling sick later. This fun activity is a great alternative to treadmill, stair master, and elliptical bike workouts. Not to mention that you can progress at your own pace and choose the desired speed and resistance. When you attend spinning classes, you’ll meet other fitness buffs and learn new tricks for losing weight or staying fit. This is a great way to make friends and change your workout routine. If you enjoy lifting weights, do spinning instead of cardio on non-training days or after finishing your workout. What to Eat Before a Workout to Build Muscle and Strength?